In the complex world of real-time policy and charging enforcement, interoperability and scalability are key to achieving your goals. Allot’s Policy and Charging Enforcement Function (PCEF) and Traffic Detection Function (TDF) solution, ensures you can deploy services rapidly, integrate seamlessly, and scale as you rollout new services. Part of the SmartPCC solution, Allot TDF/PCEF interoperates with Allot PCRF as well as with multi-vendor PCRF and OCS/OFCS equipment. Allot TDF accurately classifies and meters data usage per application, user, and device. It delivers these granular data records in real time to the PCRF and OCS/OFCS elements in your network. 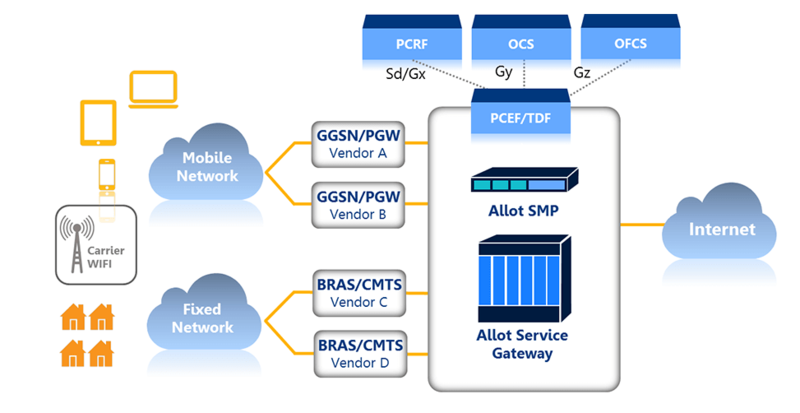 The Allot PCEF (or other network element) then enforces traffic management and charging policy with high granularity so you can ensure that your OTT applications and services are performing optimally according to network conditions and subscriber expectations. As a single point of integration for traffic classification, management, charging, and steering, Allot PCEF/TDF solutions, powered by the Allot Service Gateway, enables unified traffic detection and policy enforcement across any mix of access technologies. Clustering many Allot Service Gateway platforms to work as one lets you scale PCEF/TDF throughput up to Terabits per second, while maintaining accurate traffic classification and control even when asymmetric upstream and/or downstream IP flows are processed by different platforms. Allot’s intelligent PCEF/TDF functionality, whether physical or virtual, complies with 3GPP standards and interface specifications (Diameter Sd/Gx, Sy, Gy, Gz) to assure maximum efficiency together with higher scalability and performance than any other PCEF/TDF solutions. This tier-1 service provider in LATAM uses Allot Policy & Charging Control solutions to attract new prepaid customers with zero-rated apps, and to prevent fraudulent use of the service. Allot's virtualized TDF and PCEF functions can give you greater flexibility to create, deliver and monetize data services. Gain visibility and control to optimize your network, rapidly rollout revenue-generating services, and deliver a high QoE via a virtualized, scalable gateway. Centrally manage network-wide policies, traffic monitoring, and usage reporting to optimize your IP services and QoE.